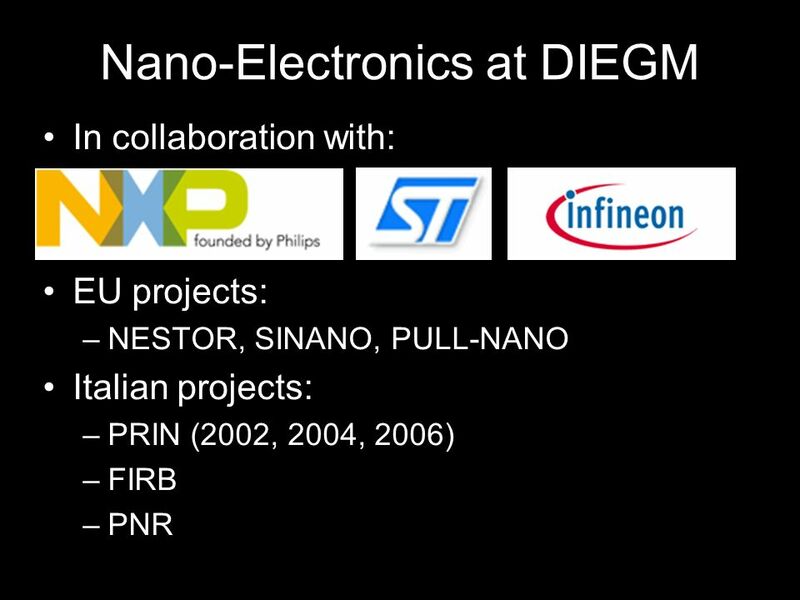 Nano-Electronics at DIEGM In collaboration with: EU projects: –NESTOR, SINANO, PULL-NANO Italian projects: –PRIN (2002, 2004, 2006) –FIRB –PNR. 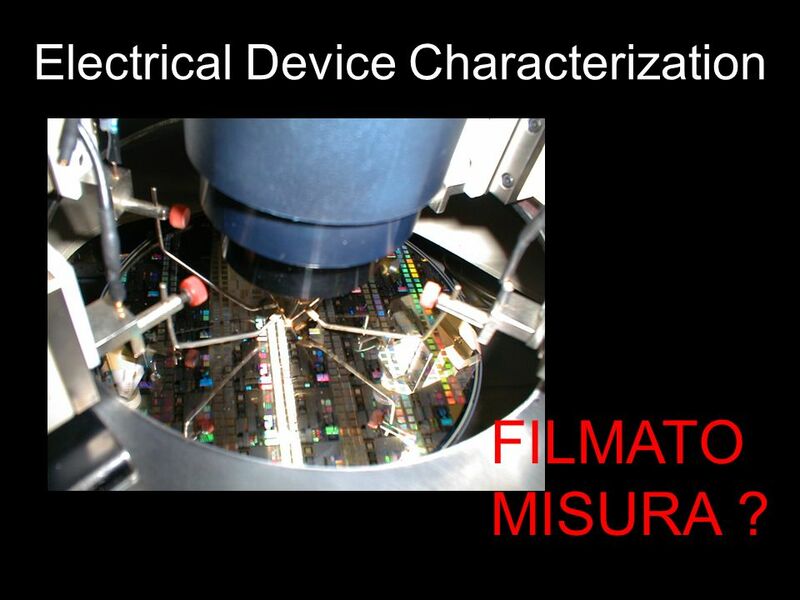 6 Electrical Device Characterization FILMATO MISURA ? 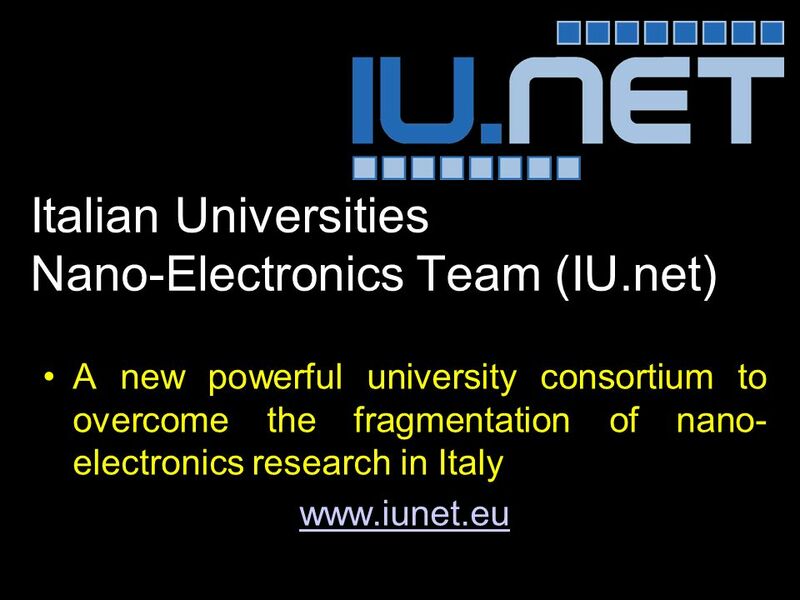 Download ppt "Nano-Electronics at DIEGM In collaboration with: EU projects: –NESTOR, SINANO, PULL-NANO Italian projects: –PRIN (2002, 2004, 2006) –FIRB –PNR." P. Sapienza, Laboratori Nazionali del Sud (INFN)NOW2004, sept A km 3 detector in the Mediterranean: status of NEMO Motivation for a km 3 detector. 18 July 2001 Work In Progress – Not for Publication 2001 ITRS Front End Process July 18, 2001 San Francisco, CA. ITRS Meeting. Stresa, Italy. April 19-20, G. Bomchil. 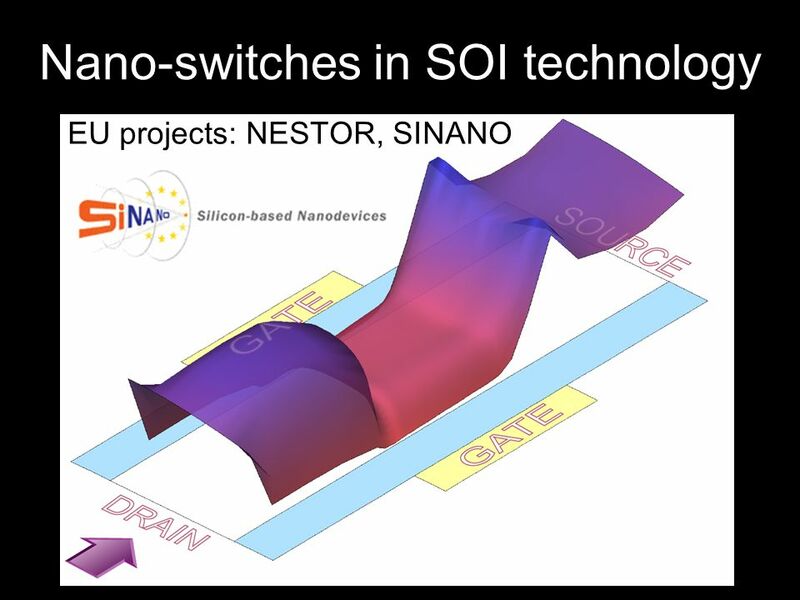 ST Microelectronics 1 Integrated Project « CMOS backbone for 2010 e-Europe » NANOCMOS From. DRAFT - NOT FOR PUBLICATION 14 July 2004 – ITRS Summer Conference PIDS Status and Key Issues: 2004 and 2005 ITRS Peter M. Zeitzoff for PIDS Technology. DRAFT - NOT FOR PUBLICATION 14 July 2004 – ITRS Summer Conference ITRS FEP Challenges Continued scaling will require the introduction of new materials. Università degli Studi di Pisa IWCE-10 Purdue University 2004 M. Girlanda, I. Cacelli Dipartimento di Chimica e Chimica Industriale – Universita degli. 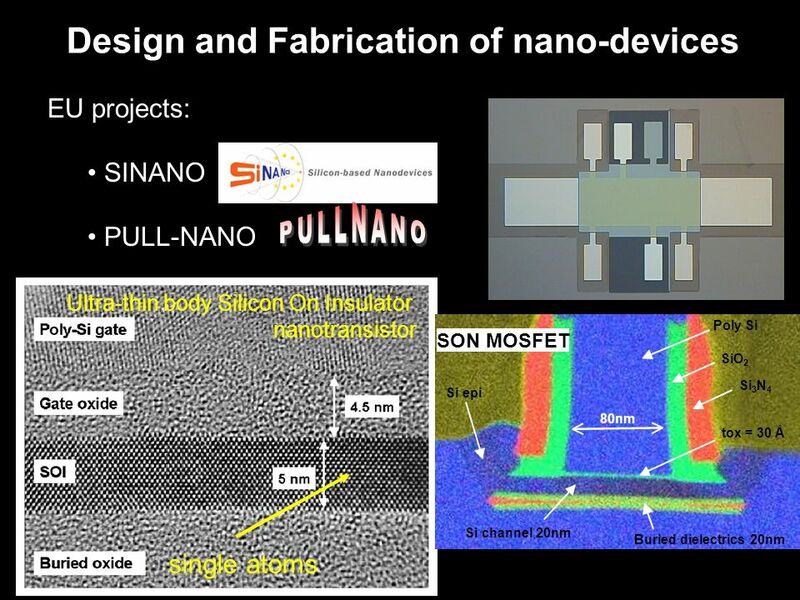 Silicon on Insulator Advanced Electronic Devices Karthik Swaminathan. 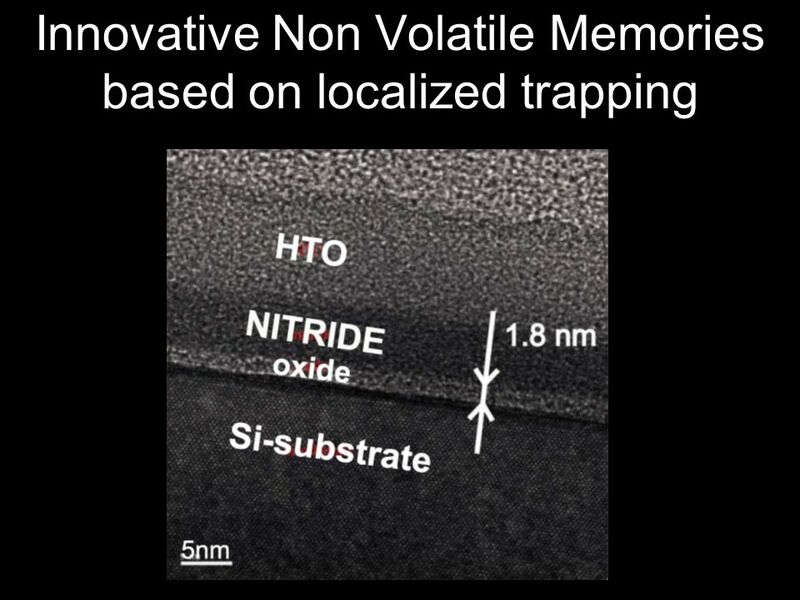 Accumulation Gate Capacitance of MOS Devices with Ultra-thin High-K Gate Dielectrics: Modeling and Characterization Ahmad Ehteshamul Islam and Anisul Haque. 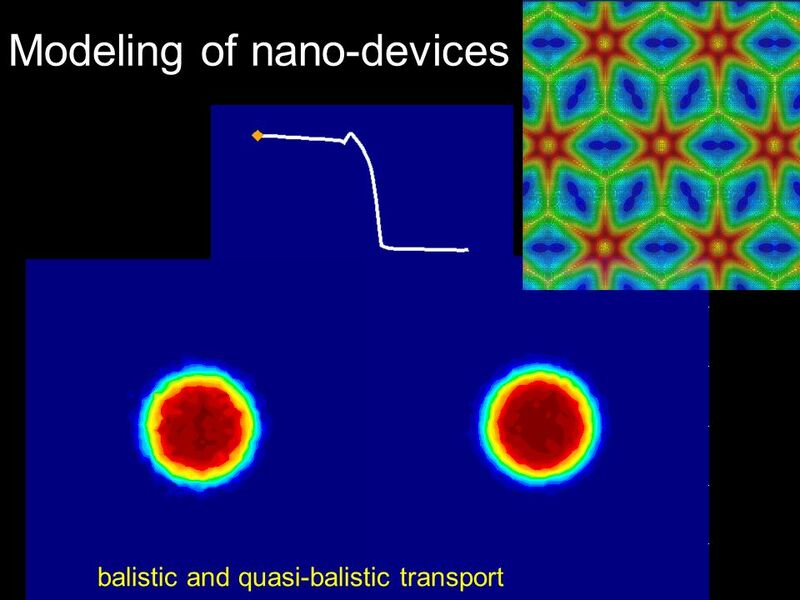 Savas Kaya and Ahmad Al-Ahmadi School of EE&CS Russ College of Eng & Tech Search for Optimum and Scalable COSMOS. 1 M. Casalino , L. Sirleto , L. Moretti , I. Rendina   Istituto per la Microelettronica e Microsistemi (IMM), Consiglio Nazionale delle. School of Electrical and Electronic Engineering Queens University Belfast, N.Ireland Course Tutor Dr R E Hurley Northern Ireland Semiconductor Research. 1/11 Activitats en Nanotecnologies Grup de Dispositius, Sensors i Disseny VLSI Eduard Llobet Lluís F. Marsal.